The downloadable Trackster 3 patch that is on this page is specifically for Trackster 3 users that receive the following error message when attempting to export a Trackster report to a file on their hard disk. 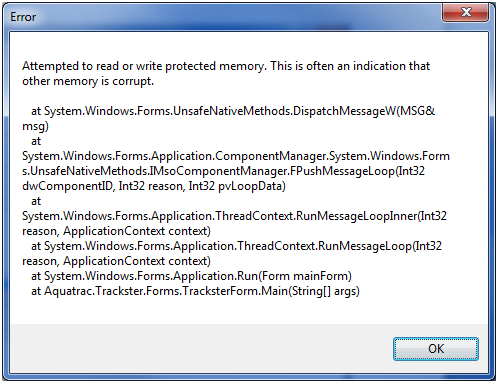 "Attempted to read or write protected memory. This is often an indication that other memory is corrupt. Download this "PEGRP32C.DLL" file to "C:\Program Files\Aquatrac\Trackster"